Doreen has always enjoyed creating things and although she was an ‘A’ level Art student she chose to pursue a career as a senior manager in Sales and Marketing with a blue chip company. Eventually she took early retirement and decided to do all of those things that she previously had no time for. She attended Sheffield College for 2 years on a Creative Jewellery and Silver course, then joined a Glass Fusion course and found a medium that she loves working with. Glass is both ‘beauty’ and ‘the beast’ and makes creating artwork challenging. The technical aspect of fusing glass adds an additional dimension to the art and leaves scope for continued learning and experimental work. Doreen works from a small studio at her home and tries to source her materials locally where possible. Her inspiration generally comes from the environment and she particularly likes texture. 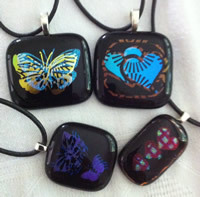 She also loves the unique quality of Dichroic glass and how the colours reflect their surroundings. In the future she intends to incorporate silver into her work. 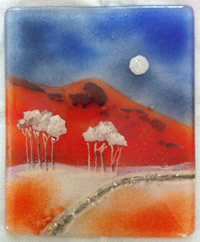 Doreen's recent training has been in Screen Printing on Glass and Landscapes in Glass at Warm GLass Studios in Bristol. 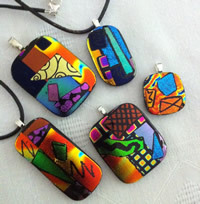 She has also attended a workshop given by Tanya Veit on her "Picasso Technique" for dichroic jewellery. 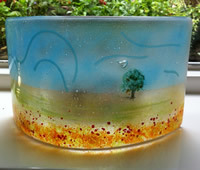 Tanya is a renowed American glass artist and travels all over Europe and North America holding workshops on her process. Doreen is happy to design bespoke pieces and tiles to incorporate in bathroom or kitchen design.